Absolute Outfitters welcomes you to the Miramichi River and all it has to offer! We are a licensed 3 Star Canada Select Outfitters in Miramichi, New Brunswick, Canada. 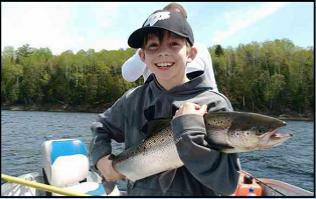 Fish the Miramichi River for Atlantic Salmon, Bass, and Trout. Our Spring fishing won't be beat! We are an experienced fishing camp with knowledgeable guides and awesome fishing! Miramichi salmon fishing season starts April 15th! Professional Spring and Fall Bear Hunting. 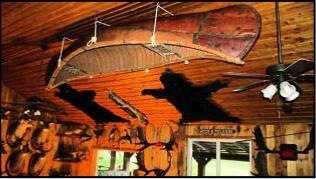 Twin Pine Lodge is a great New Brunswick bear hunting camp in the center of some of the best bear hunting zones. Moose Hunting, Deer Hunting - there's so much to do in this part of Canada! Visiting the Miramichi for Gallan's Tubing, Irish Festival or other Miramichi event? Rent our unique NB outfitters lodge. Stunning and traditional, Twin Pine Lodge, has a beautiful view of the Miramichi river and a 14' stone fireplace. The "New Camp" which is also on site is available too. It's a beauty of a spot to rent for a weekend away. Visiting the Miramichi for Gallan's Tubing, Irish Festival or other Miramichi event? Rent someplace unique like our NB outfitters lodge. The Miramichi ROCKS! Come try our great Miramichi adventures!